Noel: Black with orange peel, apple, almonds, cinnamon, spice and rose petals. Christmas Tisane: Chunks of fruit including papaya, apricot, peach, apple, mango, cranberry, cherry, strawberry, hibiscus, orange peel, cinnamon chips, cloves and rose petals. 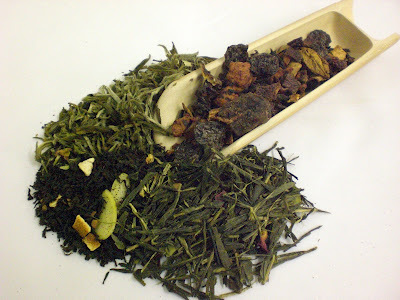 Evergreen: Green with orange peel, apple, almonds, cinnamon, spice and rose petals. Spice of Ice: Pai Mu Tan (China White) with orange peel, almonds, rose petals, cinnamon chips, apple and spice.